I reviewed Doris Lederer�s last disc of British music on this site about a year ago. There she essayed a pleasing mix of repertoire and included the Bax Fantasy Sonata, some Bridge morceaux, Vaughan Williams� Romance and some Grainger and Britten. 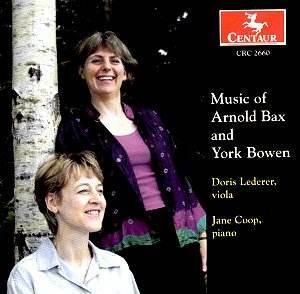 This is clearly music that appeals to her because now she has narrowed her recording focus still further with one of Bax�s great chamber works, the Viola Sonata and two substantial works by York Bowen. Lionel Tertis was never asked to record the Bowen Sonatas and so we don�t know, unlike the case of the Bax Sonata, how he would have played them; but those who know Tertis�s recordings can make a reasonable stab. Richness and opulence of tone, digital flexibility, relatively fast tempi and an abundance of luscious and ceaseless portamenti would be the way. To this extent when listening to Doris Lederer�s new recording and the recent Dutton all-Bowen release by Boyd and Forsberg � where the C minor and the Phantasy are common to both � we find a fruitful divergence of approaches. Boyd�s cellistic tone more approximates Tertis�s whilst Lederer�s leaner, more focused sound reminds one rather more of the Primrose alto tradition. In the Allegro moderato first movement we find that Boyd tends to lean on phrases, squeezing the juice out of them � most attractively � whilst Lederer is more no-nonsense. Brisker, certainly, but it�s not simply a question of tempo. She doesn�t halt at comma points or sculpt with over emphasis. In the molto espressivo second subject Lederer and Jane Coop manage to catch the romantic depth as well as the more genial lightening of tone. Their animation is also firmly directed in a work that can rapidly inflate itself through over-fond attention. Boyd and Forsberg are slower, their rubato is more elastic, and there are moments when I found them, for all their obvious affection, just a touch episodic. Forsberg is the more assertive pianist, assisted by a warmer and more obviously sympathetic acoustic, and they can also find the humour latent here as well as a heart-stopping couple of pianissimos. The slow movement always sounds to me like the distant cousin of a spiritual. Once more the Lederer-Coop team is the fleeter of the two and they are also quite dramatic, vesting the movement with quicksilver incident. Tonally she doesn�t have the depth of the lower two strings that Boyd does, but her less explicitly romanticised approach demonstrates that this work can take different approaches and work successfully. She and Coop certainly bind the occasionally discursive and unbalanced writing (the two instruments are not always ideally balanced by Bowen) with convincing insight. In the finale Boyd and Forsberg are up to tempo, even fractionally faster than the North American pairing. This is the movement where Dutton�s superior engineering really pays off because things are just that much more immediate in their recording, the molto vibrato episode speaking that much more emotively, the terpsichorean drive just that much more involving in their hands. Both partnerships relish the humorous pointing though Boyd is saucier than Lederer�s slightly more aloof profile. Both recordings however respond individually and vibrantly to the writing and make a persuasive case for the C minor Sonata. The 1918 Phantasy is once again common discographic ground. For all Boyd�s depth and subtlety of tone, Lederer may well have the edge here. Her tone is again alto-ish where his is more cellistic but she finds a greater and more incisive sense of direction in a work that can easily buckle through introspective fragmentation. I particularly relished her mezza voce in the central panel as well as the walking pace poco andante of the opening with its admixture of keening folk edge. It�s not a surprise that she and Coop are a full minute quicker than Boyd and Forsberg and it�s decidedly to the work�s advantage for all the attractive qualities cultivated by the latter pairing. The Bax Sonata still doesn�t have the decent representation in the catalogue that it deserves. Numerous examples are long out of print: will someone resurrect the Downes/Cassini, Milton Thomas/Stevenson and Vardi/Bogin recordings. Lederer phrases here with commendable directness. In the first movement she doesn�t inflect with constant colour, as Primrose does, nor does she lavish a huge wash of vibrato on the folk episodes, as Tertis did, at a sprightly tempo, with the composer at the keyboard. As a result she and Coop are not, equally, as vertical or abrasive in their response as Primrose and Harriet Cohen were. Clearly part of this is structural � as Lederer and Coop search for the most intensive moments of declamation to make their points. And there is considerable virtue in this leaner, less dramatic approach, a more lateral, integrationist one. In the finale, though they play adroitly, I felt just a want of fantasy tinged with tragedy such as one gets from the most intuitive performances � though I wouldn�t overstate the case. In terms of structure this is an acutely realised performance. With good documentary notes and production values this is a fine contribution to the literature � exploratory and understanding. Let�s hope these two musicians continue to cast their net over under-explored areas of repertoire with such perception.